Wonderful experience at Surya Mother and Child Hospital and I highly recommend it to all mothers-to-be. One of the best decisions I have ever made was to deliver my precious baby girl, Arya, at Surya Mother and Child Hospital. The staff are highly trained, warm, and work with passion; the facilities are state of the art, and the cleanliness is outstanding. What I loved most of all was that Surya being a speciality hospital, caters only to mother and child, which meant that no matter what time of day or night I had a concern, including at 3am on the second day after Arya was born, a specialist (and not a general on-call doctor) was immediately available to attend to both of us. We had a wonderful experience at Surya Mother and Child Hospital and I highly recommend it to all mothers-to-be. 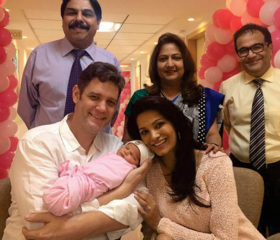 Melanie and I just wanted to thank the entire “team” who helped make India’s birth truly INCREDIBLE! With India now 3 days old, Melanie and I have had some time to reflect on the amazing birth experience we have just been through. No strangers to bringing children into this world, you would think that we would be calm throughout, but having chosen to have the delivery in India, we were slightly nervous, despite all our combined “experience”! However, our apprehension was laid to rest as soon as we met our midwife, Lina Duncan and she took Melanie to meet Dr Ameet Dhurandhar at Surya Childcare Hospital. Lina is an expert in home and water births, and was really excited about helping us through this beautiful journey, but it was Dr Ameet’s “hands off” approach that truly allowed us to embrace this new experience, and we found his attitude towards our wishes and Lina’s expertise, both empowering and respectful. Melanie and I just wanted to thank the entire “team” who helped make India’s birth truly INCREDIBLE! Thank you for the wonderful stay with fantastic service at one of the most precious memorable time of our lives. We will always appreciate our time spend here. Arya’s First few day of her life. Hari is giving to Edith and also to my wife and me. We feel that Edith is in safe and caring hands and thank you and all of your team.